Hi! I'm here with another fun sketch from the team at Freshly Made Sketches and this week my Aussie mate, Narelle, is our hostess. 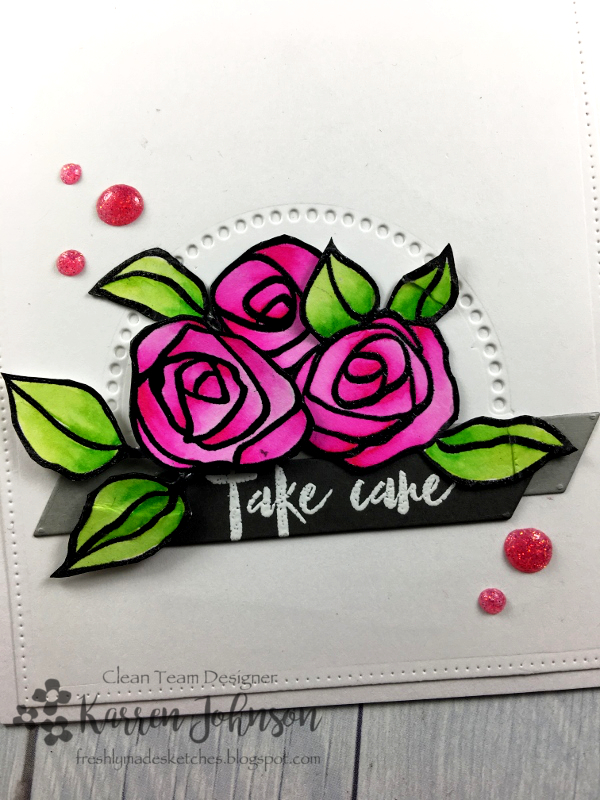 I black-embossed the flowers onto Bristol Smooth cardstock and colored them with Zig markers. From there, the plan was to die-cut them with a circle die, doing some out-of-the-box die-cutting. That worked fine but then I stupidly decided to add some gray around the outside. What a mess! So to fix it, I splattered on some Black Soot ink. Double mess! To fix the problem I fussy cut the flowers. 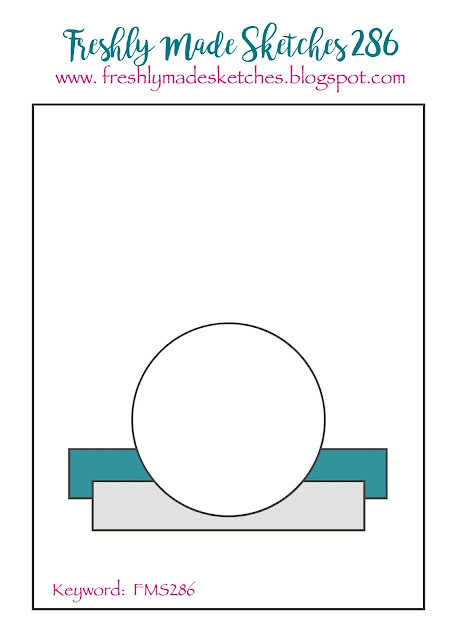 I took a white card panel and die-cut it with a dotted half circle die. I adhered two angle-cut strips - the top one having been white-embossed. After I added the flowers with foam tape and adhered the panel to a top-folding card base, I added some Nuvo Shimmer Drops and called it done! Thanks so much for visiting. As always, the rest of the design team have some gorgeous cards to inspire you. 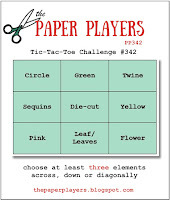 I'm linking this up to the tic-tac-toe challenge at Paper Players - using the Pink-Leaves-Flower combo. Looking at this pretty card it's hard to imagine that it gave you so much trouble! I'm glad you didn't give up on it because I love how it came out! This is such a beautiful card Karren! I love those flowers! The colours are so vibrant! Love the enamel dots too! Just fabulous! Simply stunning Karren, love the vibrancy of the colour. Well you might have had a few creased leaves Karren but I think this card is totally worth it! I love the bold outlines of your flowers - they really make the pink pop and the creative punched arch behind is also a neat touch. Thanks for joining us over at The Paper Players this week! 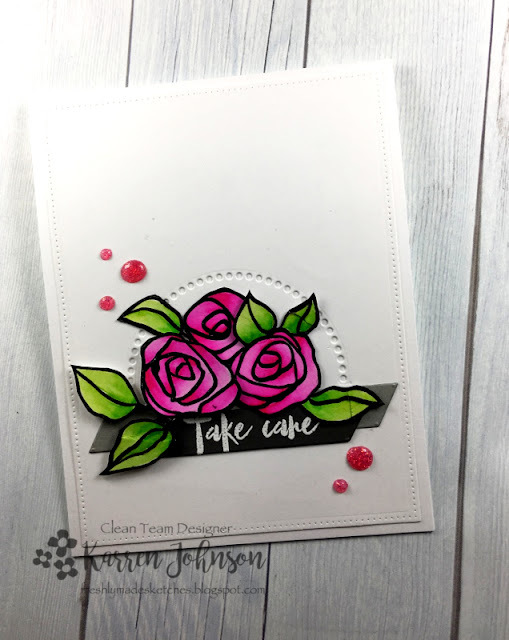 Great save on the flowers and honestly, I wouldn't have noticed the creased leaves if you hadn't mentioned it :) Another really gorgeous card, Karren...beautiful bold flowers and stunning CAS design! Nice save! You'd never know from the finished product that this card gave you any trouble at all! It's beautiful! Wow! The roses look like stained glass, so rich and fresh. Such a pretty card. Oh I love this! Your flowers are just stunning and have such depth to them. I adore everything about this card! Gorgeous Clean and Simple Card! You are your own worst critic for sure! These flowers are stunning. Period. No debate. Love this card!